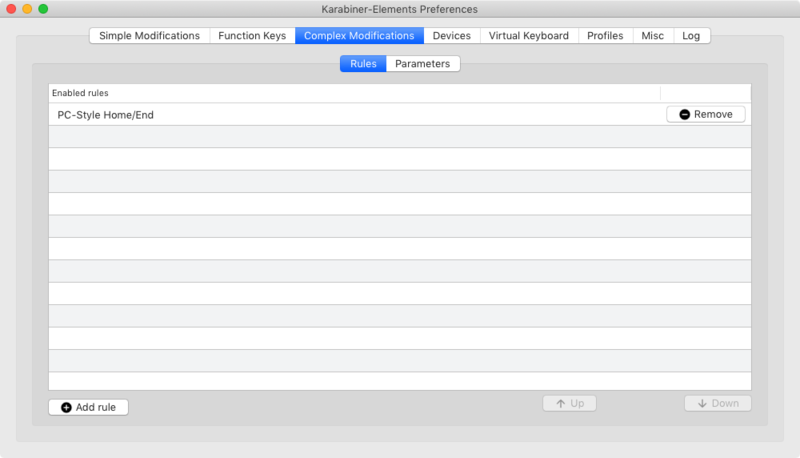 Can I change the behavior of the Home and End keys on an Apple Keyboard with Numeric Keypad? I just bought an "Apple Keyboard with Numeric Keypad", then I connected it to my Macbook Pro running Lion. But the home and end key under the F14 key doesn't work as I expected. Say in "Pages", the home key doesn't bring the cursor to the beginning of the line, while the end key takes you to the bottom of the page. Does anyone know how to re-map the home/end key? Quit and reopen applications to apply the changes. Note that DefaultKeyBinding.dict is not supported by some applications like Xcode or Firefox. In Terminal you can assign home (↖) to control-a and end (↘) to control-e from Preferences > Settings > Keyboard. That will leave you with no key combinations to scroll to the top or bottom of a window though. The setting is defined in Resources/include/checkbox/for_pc_users.xml. 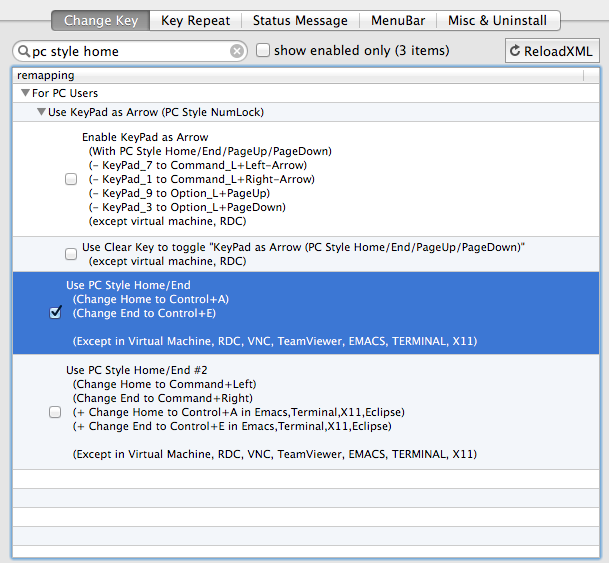 Then open the KeyRemap4MacBook application, press the ReloadXML button, and enable the setting. See https://pqrs.org/macosx/keyremap4macbook/xml.html.en for more information. Since this answer ranks well in search engines, I want to explain how I did it with the latest version of Karabiner. You will only need to choose "Add rule" and find the "Use PC Style Home / End" setting right there. I followed this blog post and it did the "home" and "end" key bindings as well as a few other userful adjustments. Not the answer you're looking for? Browse other questions tagged macos mac keyboard . With the “small” Mac keyboard, how to simulate a HOME, END, and PageUp, PageDown key?